I am so in love with your cabinet and the color. And I am just drooling over your collection of linens. LOVE the color of this cabinet!!! 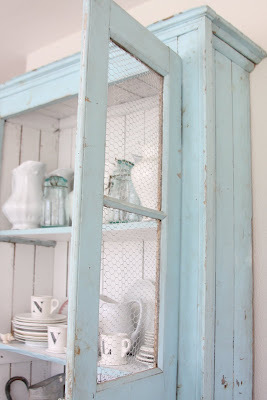 It goes oh so well with your blue mason jars and other vintage blue glass!!! 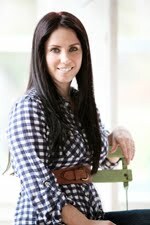 You are an awesome stager!!! Love the way you present everything in collections and in color scheme!! Love, love ,love!!! wauwwwwwwwwwwwwwwww Maria You did a great job on this cabinet! I absolutely adore it! If you would tell me you live somewhere near the sea instead as on a farm I would believe you .. Stunning color and the chicken wire (is that the name) is gorgeus ! Bellissima .... adesso me ne vado in Italia con te! I am sooo in love...amazing! 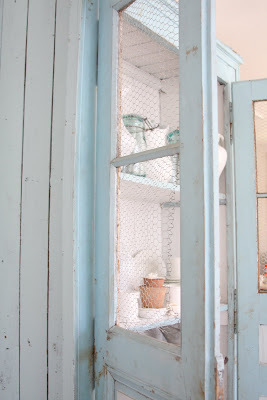 I adore blue Mason jars and I really like the chicken wire touch. The color blue is so dreamy...thanks for sharing the formula! Oh Maria, it's amazing! I love the color inside and out, just beautiful. I could look at your pictures all day! I hope your having a great week!! Wow, this is absolutely great cabinet! I love it and I love this colour! Oh WOW Maria!!! It turned out GREAT! I'm so glad you were finally able to upload it...and that you included a lot of pictures :) I love everything about it...especially all of the grain sacks :) :) You have such an amazing way of decorating!!!!! I just posted pictures of our peaceful blue family room yesterday! Maria, that's just the right shade of blue, so pretty! It is better than perfect, if that's possible. Love the colors! You make me think I may want to paint my cabinet here, I've been wanting to try something new for quite a while. 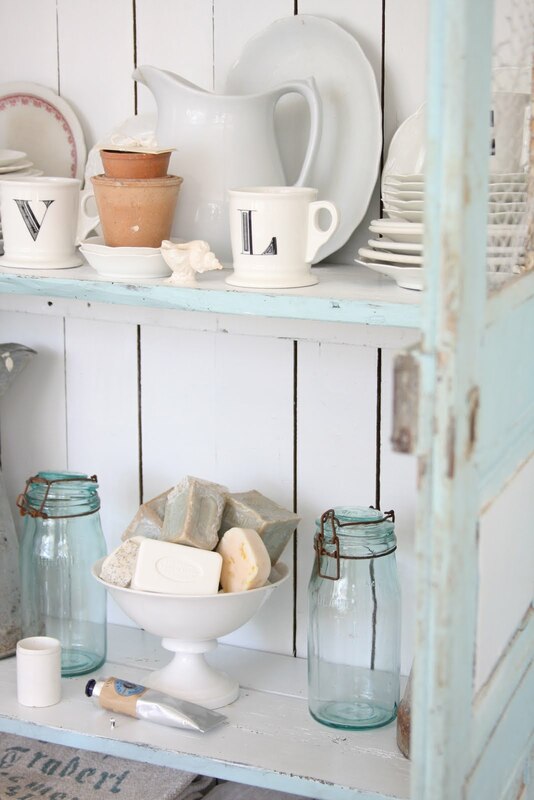 Love the French canning jars, I have some here at home too, they are the prettiest shades of aqua & light green, aren't they? I think I saw your zinc pail at Alameda last time or one really close to it w/label. Fantastic place to visit here, inspires me to do more, thank you! Forgot to wish you a happy Bastille Day since you too are a Francophile! Gorgeous color! Thanks for including the formula! It is pale blue perfection. 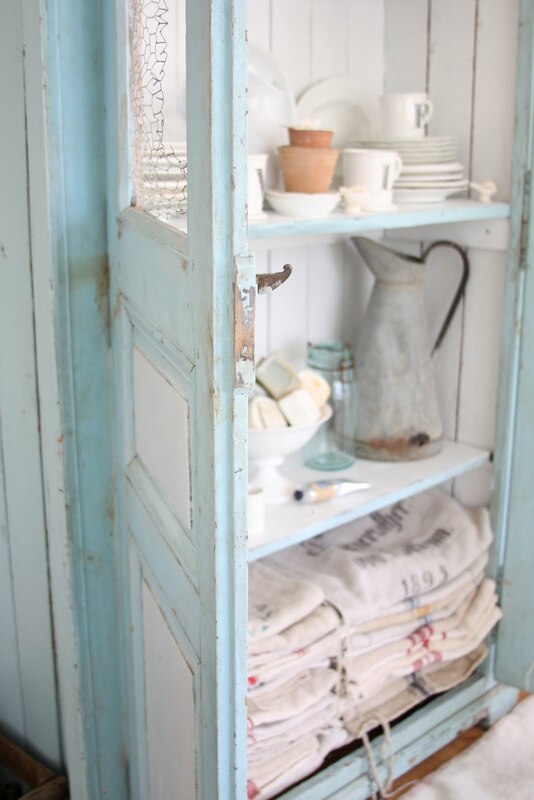 I love your little blue cupboard...it would look just fine in my house! And it looks amazing! Isn't that blue a cheery color? I have versions of it throughout my white sea cottage. I'm glad you gave us so many pictures to look at! 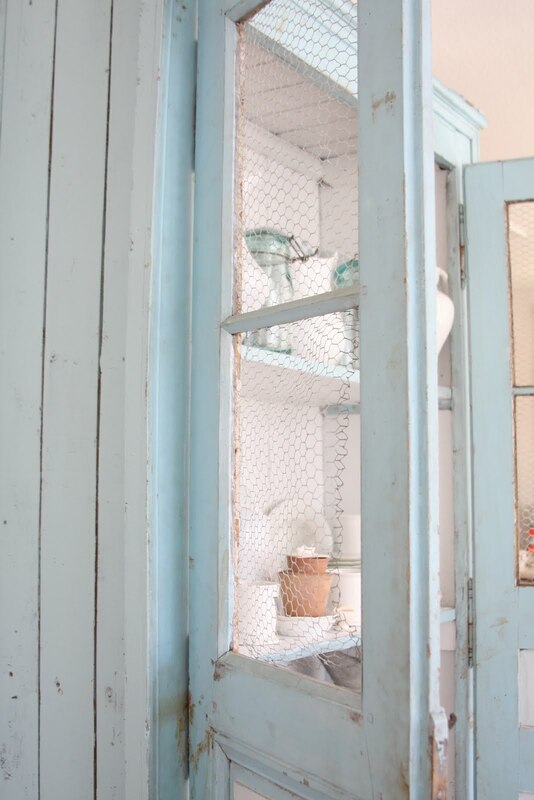 It is the perfect cabinet for that wall and isn't that the prettiest color of blue ever...and I love all your pretty things peeking through behind the wire. Wow! 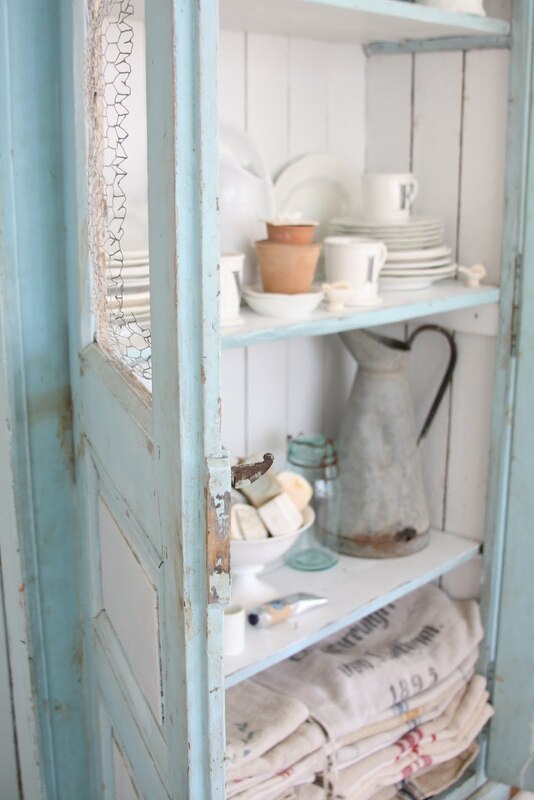 Your cupboard is so beautiful. I love the blue. Blue and white are the prettiest colors together! Lovely! Great piece! Love the color! What a gorgeous piece! And you have so many yummy things inside. Your pictures always look so heavenly. I wish I had that much light in my house. You must get sun 24/7. Such a beautiful cabinet!! Love it! Oh. my. goodness. Can I live at your house? 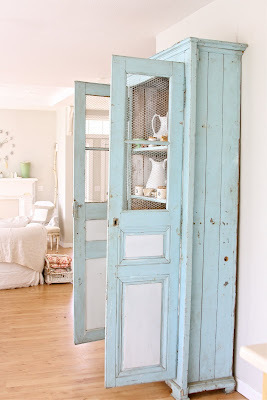 I have a piece of furniture that I am considering painting a similar color. I think I'll just have to do that after seeing your picture. 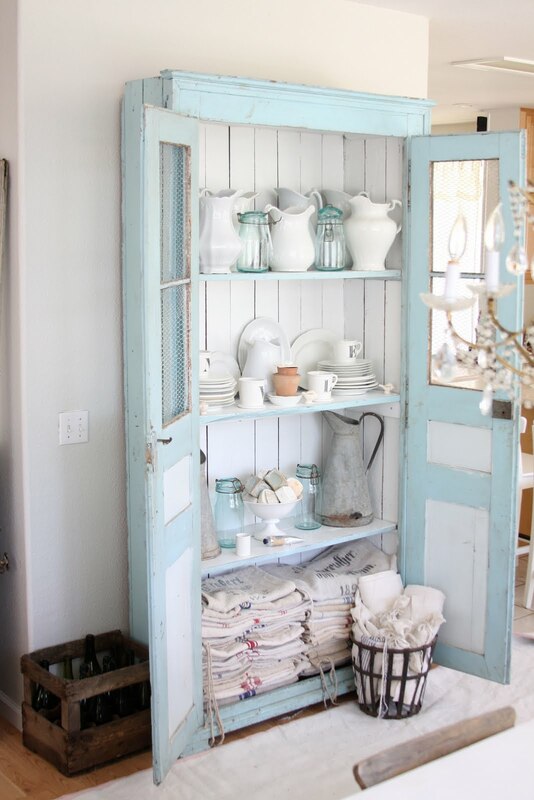 love love love this cabinet! 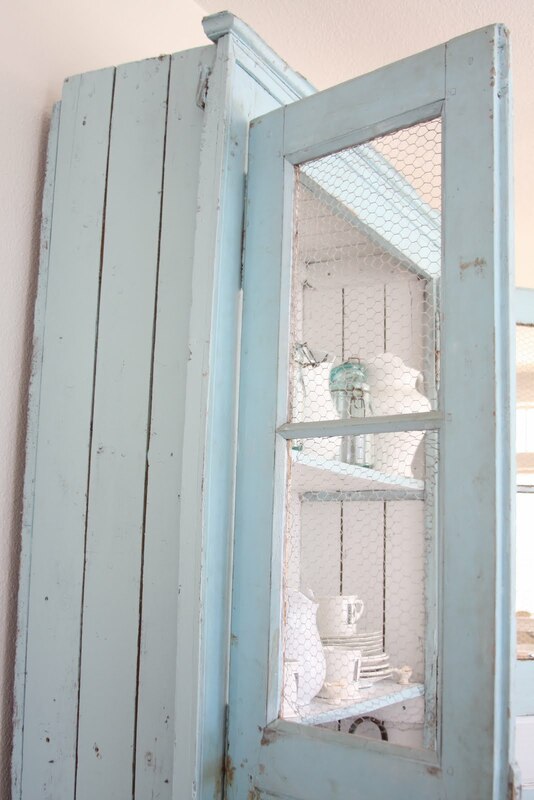 the outside color is beautiful, and i like the grayish inside color that you decided on--a perfect complement to the baby blue. Your cabinet turned out beautiful. I love everything about it and what's inside! 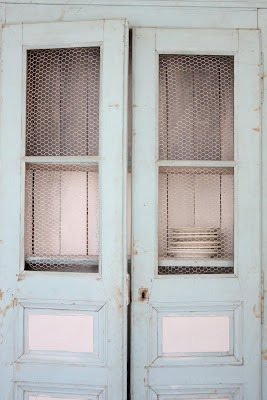 this cabinet? is this in a giveaway? tee hee (I wish!) what a beautiful cabinet! it makes me want to scrap the buffet in the dining room and go with something like what you did......thanks for the inspiration....as always!! p.s. are you freaking out yet? because you seriously have nothing to be worried about that's for cowgirl sure! p.s. I really adore Gaia's blog - its one of my favs. But I didn't have to tell you that - but it is good to hear, huh!? Maria - your cabinet turned out so beautiful! Love that color! And I can't say enough about that way you put things together to create incredible vignettes. I blubber on and on and on about that! lol! My heart stopped (again) when I saw that awesome zinc French body pitcher setting on one of the shelves (you know...the one that wants to live at my house?). 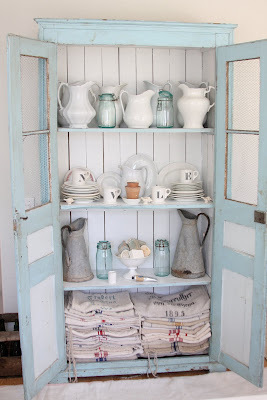 My what a perfect cupboard - I just love it! Thanks for the paint 'receipe'! Oh Maria..this looks so yummy! I love the colors you used. The way you arrange all of your treasures amazes me....so awesome!!!!! What a great cabinet! I love the color and everything inside the cabinet. I've got to show it to the "hubs". 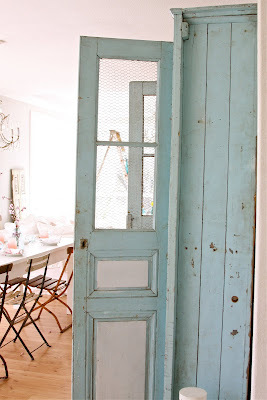 Just maybe...if I found some GREAT doors...he would...well, I can dream! OMG!*!*! Just "FaB" Maria... Jeanine, ChiPPy!-SHaBBy! You've done a fantastic job filling it up with all the things that inspire you and make you smile! I love the color...absolutely beautiful. I like what Anne Marie said...can I be the winner??????? Really though it looks stunning,now go make some pillows for the shop so I can buy one,o.k! Oooooo I want that color. That is one yummy cabinet, with very yummy goodies inside. Thanks for the recipe! hi honey ...WHERE did you day you were? right before the fifi shoot? Maria...I LOVE your cabinet!! You did a fabulous job with your color choices, and I love the way you have everything displayed in it!! I know I've said it many times before, but I can't WAIT until your online shop opens. I would love to get my hands on some of those pillows!! Now that color could not possible be more dreamy! I am actually thinking of painting my t.v armoire a grey blue color...not usually a blue fan, but I'm digging it these days! Thanks for the pics, they look so good! You did a wonderful job with choosing the inside paint, and how great to know that they came up with such a perfect match for your outside paint color. It's a beautiful piece, and it really makes a statement!! ...wowI Love you cabinet...having a bit of cabinet envy! Gorgeous pictures and love how you stage everything. Really nicely done. That blue color is really a calming, peaceful color...jsut might have to try it on something. The white interior really pops agains the blue and shows off all of your pieces so well. It turned out beautiful!! Just the right colour. 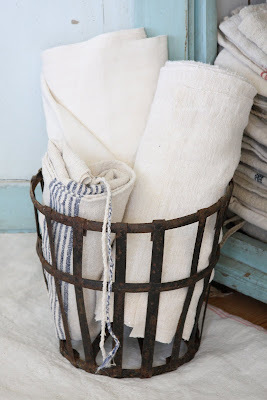 I love the things you have put in the cupbourd ..the linnen grain sacks sooo gorgeous. I collect them but they are so hard to find here in holland and veryyy pricy. Cant say it enough: I love your blog!! You are a great inspiration. Good morning Maria! It looks gorgeous! I love it!!! 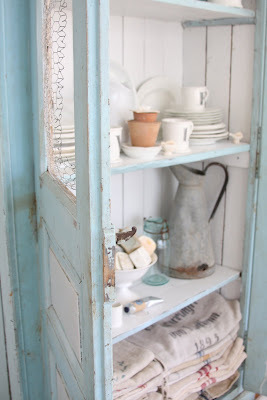 i love your blue cabinet! 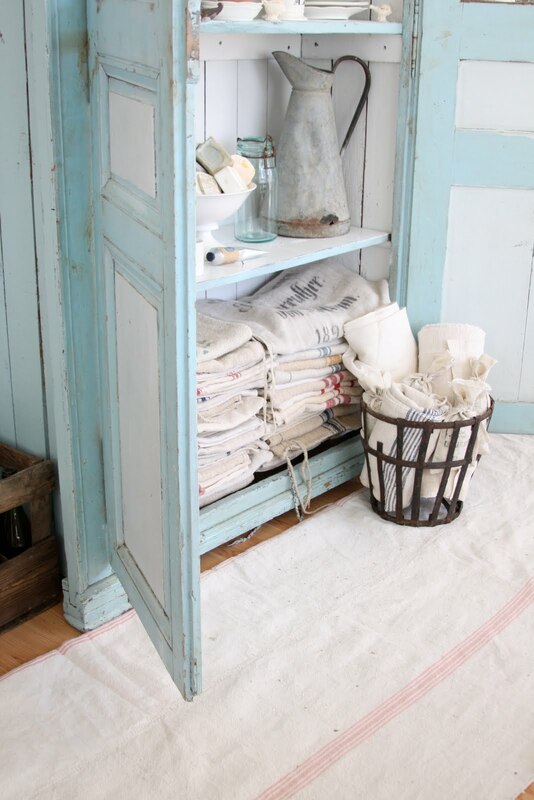 This cabinet is amazing... old things say a lot to me, and the combination of white and blue is just perfect, I love it! did i just see that you're opening a shop soon????? oh my!!! The colour is just wonderful. You have done an amazing job Maria. I cant wait to see what you are going to produce with those grain sacks. Gorgeous as always. Love your accessories too! Here a message from Holland. 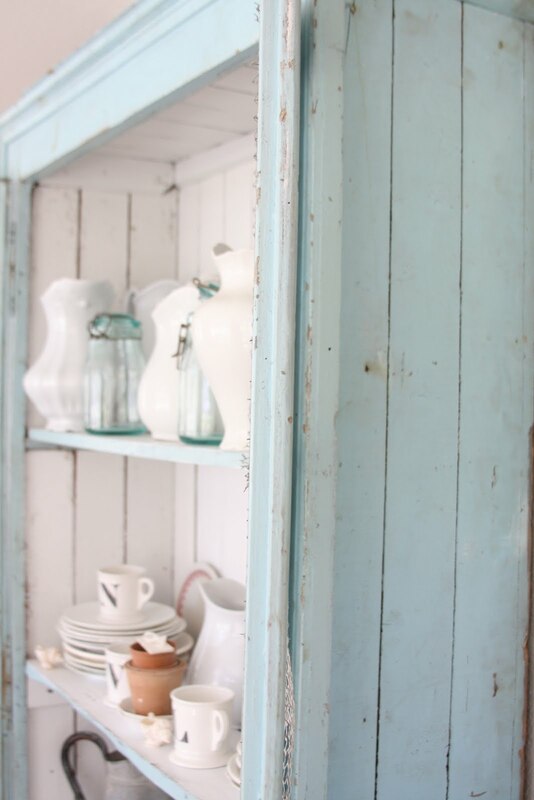 I love how you have painted your cabinet. Also love the items you have put in the cabinet. Just well and wonderfully done. It inspires me more and more to start with my first project to repaint a dark coloured sidetable. Looking forward for your next blogpost. 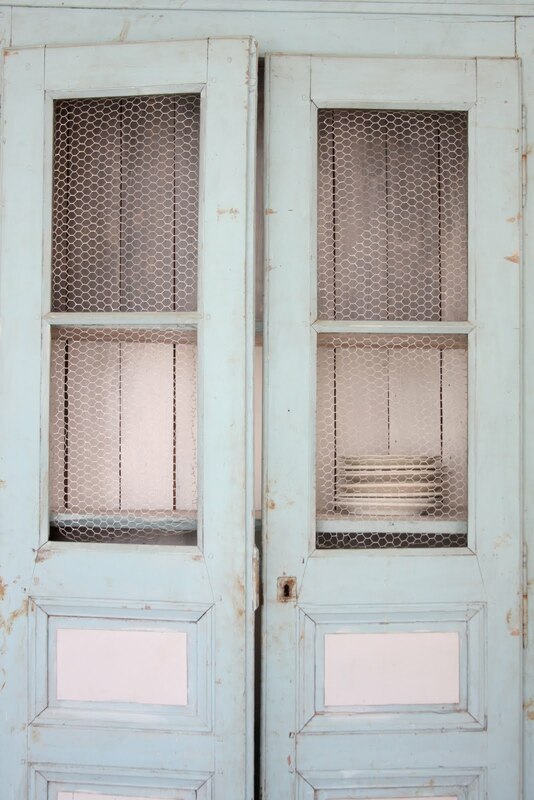 is it possible to have a crush on a cabinet? well, regardless, i am positively head-over-heels over your cabinet. thank you so much for sharing the color mix. 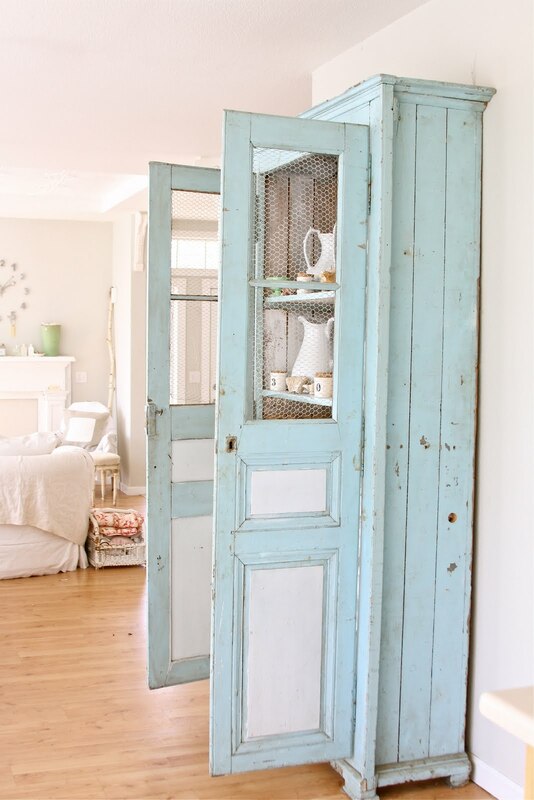 i see an armoire transformation in the near future at my house. I absolutey love it!! 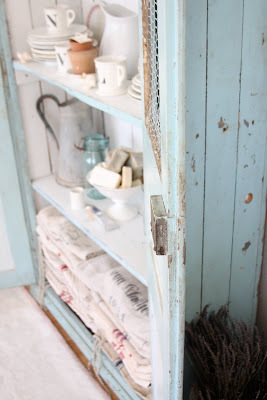 I think I may turn a small cabinet I'm finishing for my daughter and paint it blue..but then I'm going to take it over...what a great find you have. It's almost a shame to see those grain sacks leave the cupboard because they look just perfect! You are just so darn fabulous with display! I am just finishing up a yard sale cabinet of my own. Wish I would have known about this color. I love it, it's dreamy, it's magazine worthy. I LOVE tour cabinet !!! your cupboard is more than incredible! i love the colour, sooo sweet! love, love, love it. that blue is perfection!!! Absolutely beautiful! You are so talented. LOVE your blog! gah! It's perfect! I'm trying to find the best blueish greenish (a mix between robin egg and seafoam?) to paint my kitchen table....no luck yet! wow. that is amazing. i love it. i would never have guessed that you had to match the paint. they did a great job. thanks for sharing. charming and lovely, and the colors you painted it inside are a great idea.. and your pictures are perfect!!! It`s such a pleasure coming to visit you. Could you, please, go to my blog and give me some idea of the chaise longue I have found?? I would really appreciate it, I love your style and perhaps you can give me a great idea on how to renovate it!!! It's beautiful....I just picked up a similar hutch. 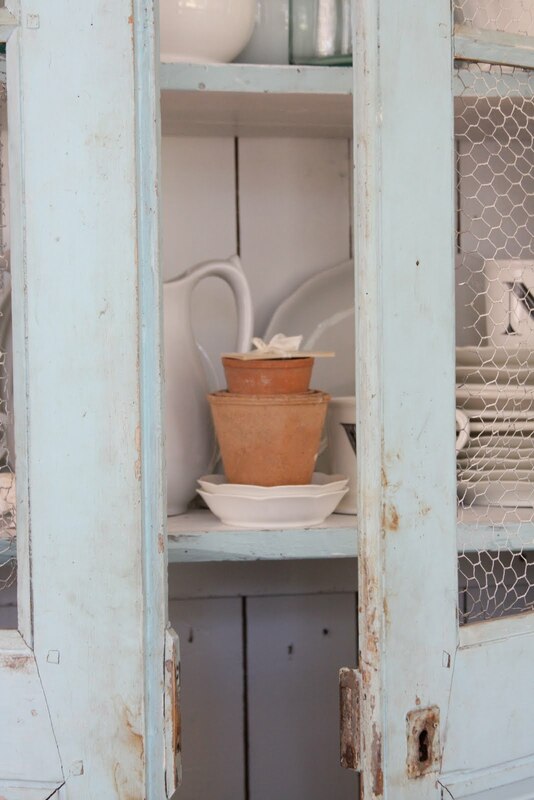 You cabinet looks lovely, the color is the perfect shade. I'm off to join you in Italy with the beautiful Gaia. She is so talented and a sweet mady. Just a quick note to wish you a fantastic Sunday! Love-love the cabinet. And what a great color!! Gorgeous. I love how you painted it and everything you decided to display inside of it. The colors are just beautiful. Hi Maria ! I love this blue color ! wonderful post again ! thank you ! You did an amazing job on this cupboard! The grey was a perfect choice! I"m totally in AWE with the cupboard and the fabulous color. Now if I can get my hands on that color. I can't believe you found that just the way it was... that's incredible! I am a follower of your blog, this post made me very well ... I would put some parts of your images and text on my blog here in Brazil. have a wonderful week! Good luck with your new shop opening. Ok, Maria. I'm back. I was having "Dreamy Whites" withdrawal...So I h found myself popping back in here to ooh and ahhh some more over your rooms, your vignettes, everything. :) Warning: You better have a barnful of items ready when you open your new store. I have a feeling you'll be selling things like crazy! lol! LOVE LOVE LOVE that color blue! Blue heaven- so very pretty. You almost have 2000 followers!!! Congratulations for reaching such a huge milestone! 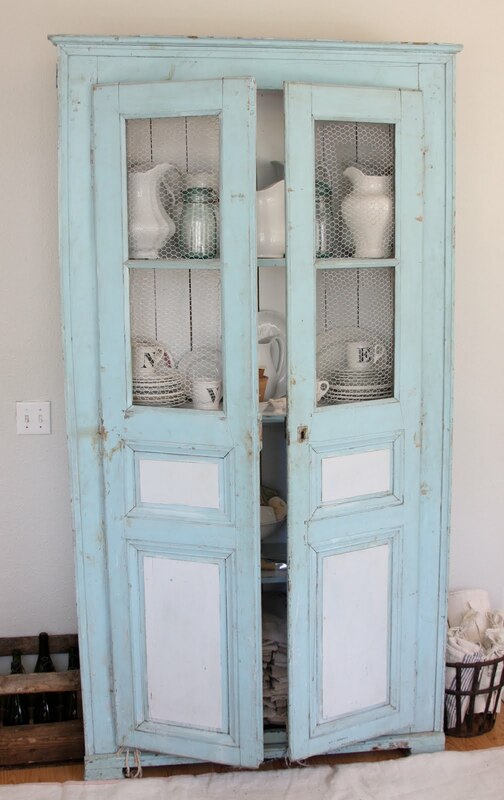 And for that cabinet...wow...it's lovely. Great job! Love your blog! Simply Beautiful! LOVE it ! It's decorated inside perfect ! it's so pretty!!! love the finish/ color!! Maria, how did I miss this? fabulous colour!!! 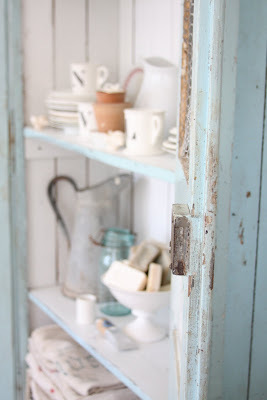 and that cupboard has such wonderful dimensions.. perfect..
it`s so pretty, i want to weep!!!!!!!!!!!! To ask permission to post your closet and text of your blog in my blog here in Brazil. I wish people here could see so many beautiful things that you put. This should be in a magazine...you have it styled beautifully. tomorrow I'll post Your Closet blue ... beautiful! big hope you like it, I'm sure everyone will love! and i love what you've filled it with. 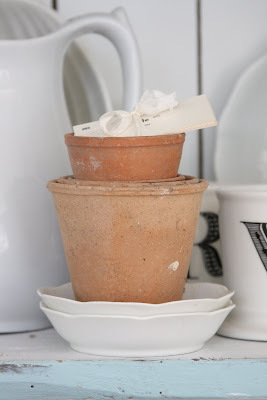 the ironstone...the burlap sacs...the anthropologie letter mugs. This is so refreshing. I just bought a cabinet from Craigslist and I have blue/white combination in the bedroom. I was thinking of doing blue on the inside and refreshing the white on the outside. Thanks for sharing and giving some inspiration. wow, thanks for posting the formula for that magnificant color... your cupboard is my favorite cupboard too I think LOL!! 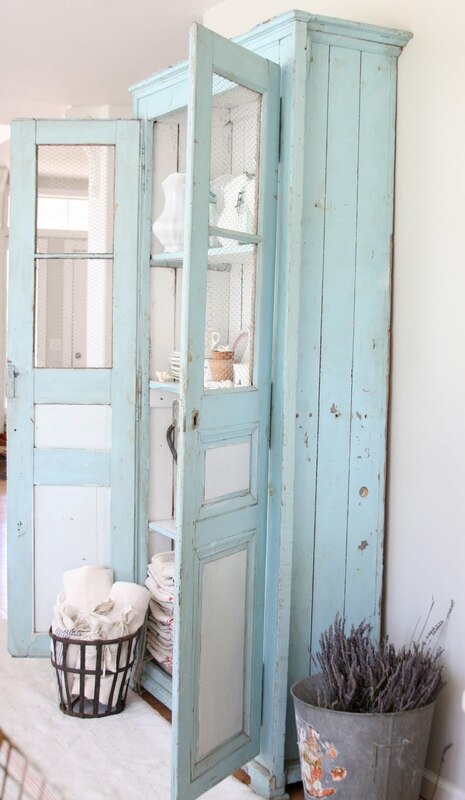 this is beautiful, love the colour...as we are designing a beach style this just inspires me, thank you!!! your blog is now my new fav. loVe it.. your spirit, style - all! can i just move in! ? i would be so inspired living at your house.. every piece is just beautiful! Your blue is devine! 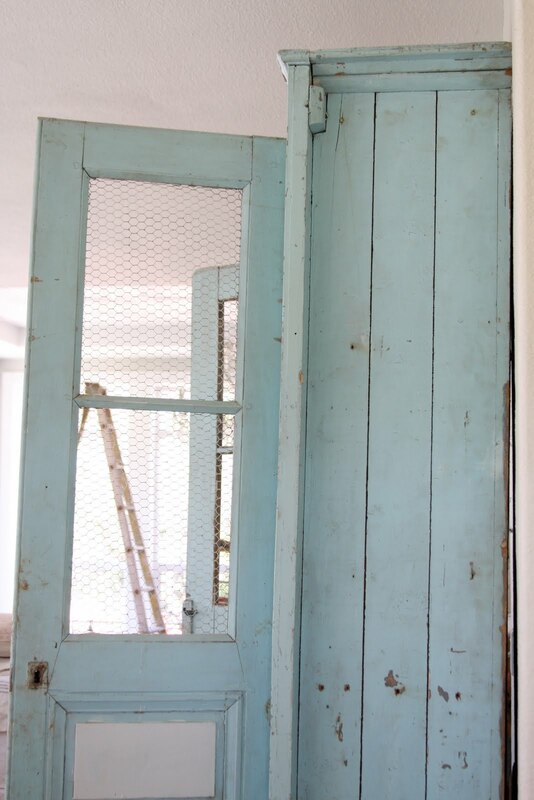 I love blue, especially tiffany, duck egg and french blues.I hope one day I'll be brave enough to paint some furniture blue! 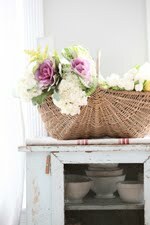 Maria, this dresser is gorgeous, as the rest of your blog. 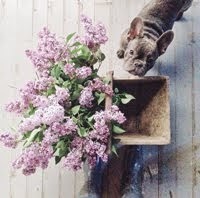 Your pictures and your interiors are so lovely and inspiring!! I have met you through my italian friends federica, gaia, irene.. and I fell in love with your style!!! Just a quick message to thank you for the inspiration you gave me today.. I really need a lot because I am redecorating a house completely, so every single picture or idea is welcome! oh what a gorgeous cupboard!!!! Sigh... it's just perfect!!! and the colour is to die for! 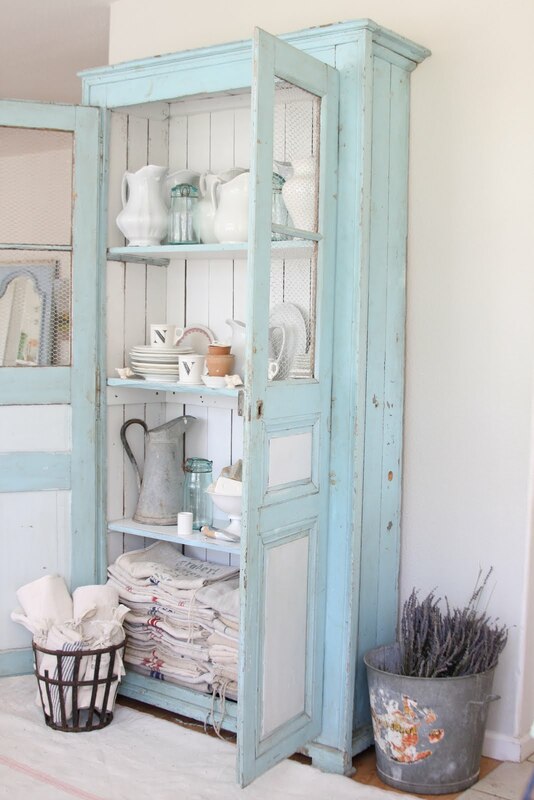 OMG I think I have just die and gone to heaven....oh I'd give anything to own that cupboard..I love love love blue..you are so lucky. I+m here on your blog for the first time and I love it! I am in love with this cabnet!! Thank you so much for sharing but also, tell us the colour. That is so sweet!! I will be writing that colour down and hopefully using one day. Hope you have a lovely weekend!! I'm a big fan of your blog! You have so much talent with style and decorating! I LOVE the blue cabinet....and I have called all the paint shops in town and none of them can make it with that certain formula? We dont have a benjamin moore here in town. Do you think you could mail me a sample so I could take it in and match it...I would really love to use that color! Don't worry about it if its too much trouble...my email is tbd86@hotmail.com if you can...contact me! I swear Benjamin Moore has the best paint colors....Just beautiful i LOVE it! 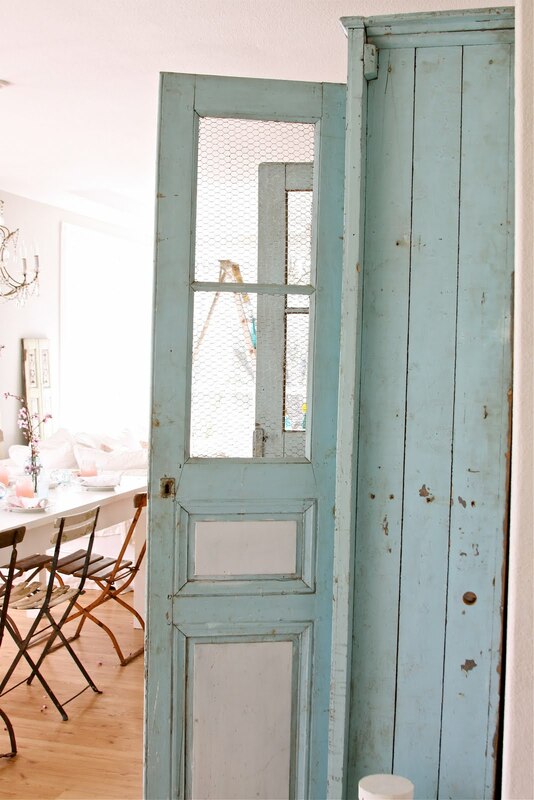 I love how light and airy the room looks yet you still worked in color like this great blue. I think I might just have to get me some of this paint. It isn't as in-you-face as a turquoise but still colorful enough that it doesn't look white. Great job. 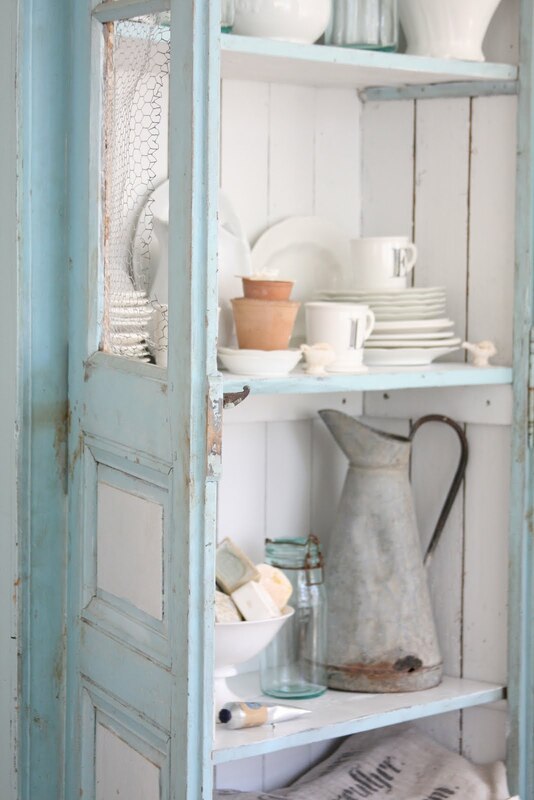 Love the cabinet and the color. It would fit anywhere with any style of furniture. You did a wonderful job. What color did they mix you at Benjamin Moore for that blue? I want to paint a chest that color. I just can't say enough about the cabinet and also the way you decorated it. I love this Pastel- colors. And this cabinet is so nice. Grow your eyelashes longer with Bimatoprost! 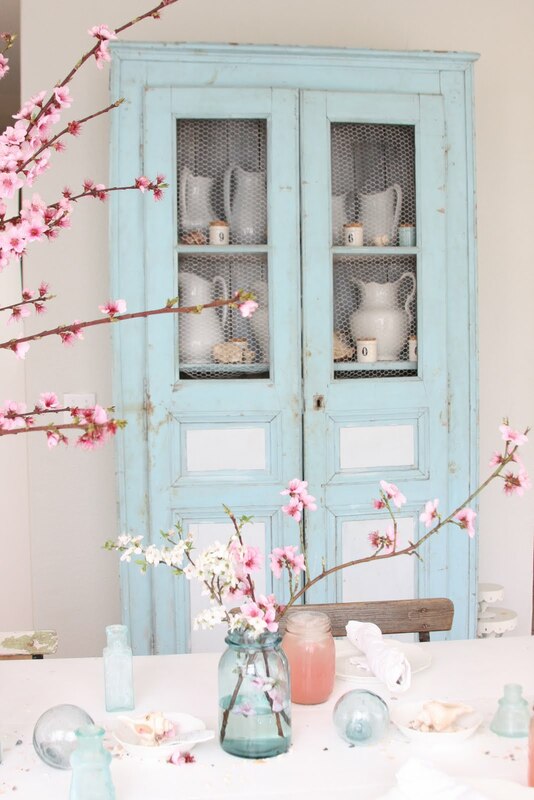 Maria; I'm in love with the colors and with the hutch itself. I'm such an armoir, hutch fanatic! I have too many of them in my house and have run out of room for them all! Guess who takes them over though when I bring them home? My husband. He starts filling them with his 'stuff' so one of my favorites is full of his red sox collections, another full of his record collections and yet another is full of his family memorabilia and photos! Do many have this problem? I think it's rare... anyway - I would love to have one like yours and have it be all for me and my own collections. 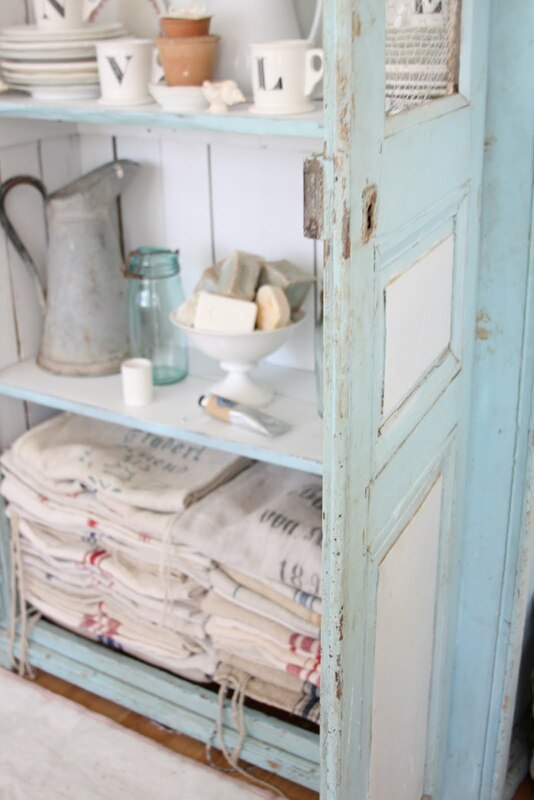 I think I'm seriously tempted to paint the hutch in my kitchen dining area that my Dad made for me - or at least to paint the inside like you did. Anyway - thanks so much for sharing I love it! 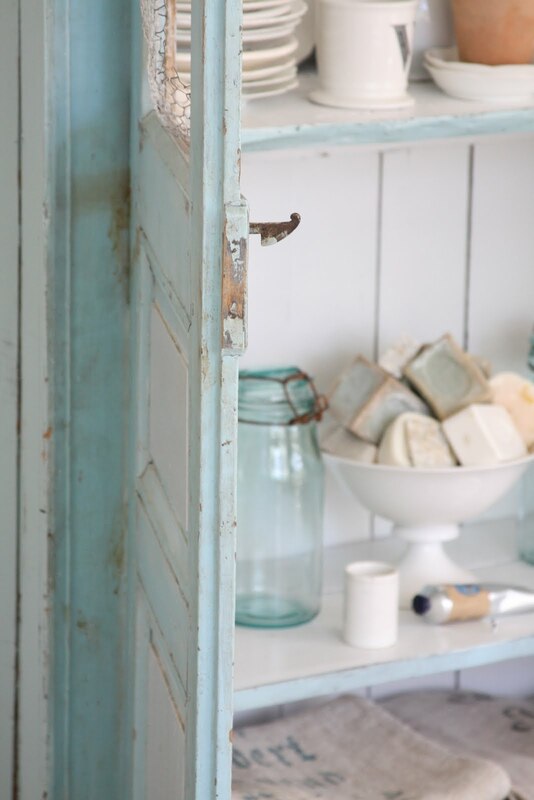 Im in love with your blue cabinet thank you so much for sharing your paint color formula. Im new to your blog but love everything Im sure I will spend hours reading and looking at everything. You have a beautiful home. Just subscribed to your blog and love it even though i dont blog but have a store. I love the cabinet. I have been looking to a bookcase I got when living in Italy. I love the idea of this! Looks great!!! absolutely to DIE for. love the colour and the style. ohhh i want one too. Love your whole blog actually and i am thrilled i found you. 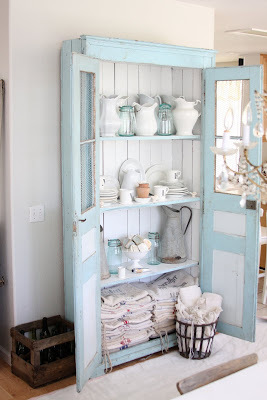 I totally love this cabinet!! Very beautiful and great color!!! You inspire us! Hi there, love your cabinet and lover your site. We are linking our blog over to yours, so hope you don't mind if I use one of your pics to do it with. Beautiful piece! Thanks for sharing that paint formula. Oh!! I forgot to say I found your blog from "Bunny Hill Designs." Love her blog. Thanks again! blue looks so pretty i love to see this it is amazing. How did I live before finding your blog?! The freshness makes me so happy. 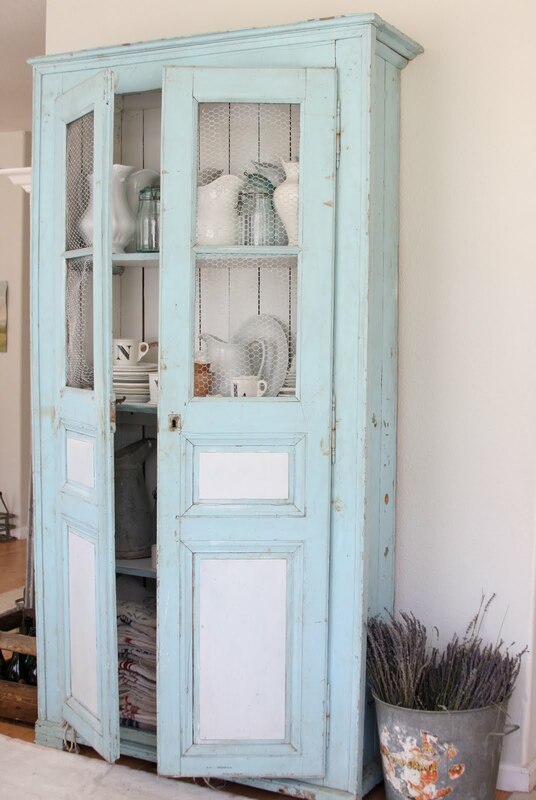 This is the most perfect cabinet, and when I painted some antique leaded windows, this was the color/finish I had in mind. But I didn't have the inspiration or know-how to accomplish this finish. I used Benjamin Moore Old Pickup Blue, which is similar in color but not as airy. I am thinking of using your formula for the wall of our built-in bookshelves (along with the mantle-painting project in white!). Thanks for sharing!!! Absolutely fabulous cupboard! Love what you've done with it! I would like to show my appreciation to this writer for bailing me out of this particular problem. Because of surfing around through the online world and coming across concepts which were not helpful, I was thinking my entire life was gone. Existing without the presence of answers to the difficulties you have resolved as a result of your guide is a serious case, and those which could have in a wrong way damaged my career if I had not encountered your web page. The skills and kindness in handling a lot of stuff was very helpful. I don't know what I would've done if I had not discovered such a step like this. I am able to at this moment relish my future. Thank you so much for your impressive and result oriented help. I won't think twice to propose your web site to any individual who should get tips on this situation. 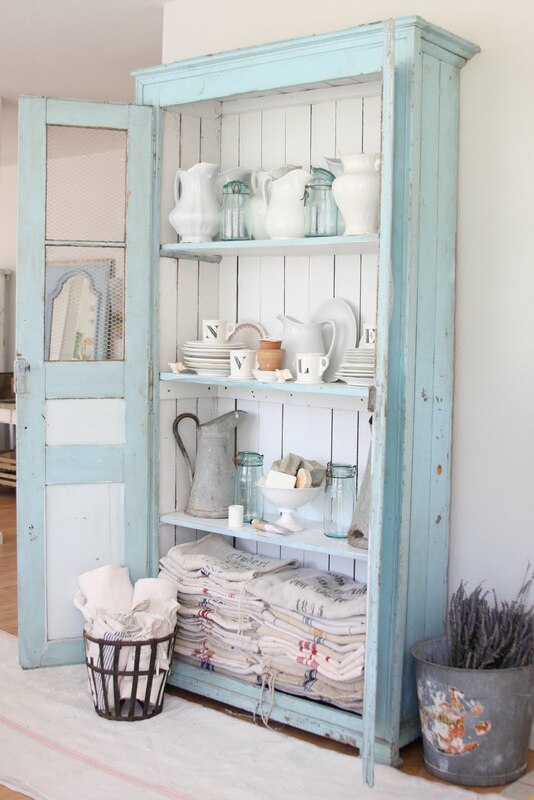 Your cupboard is amazing, nice colours and a great collection inside. 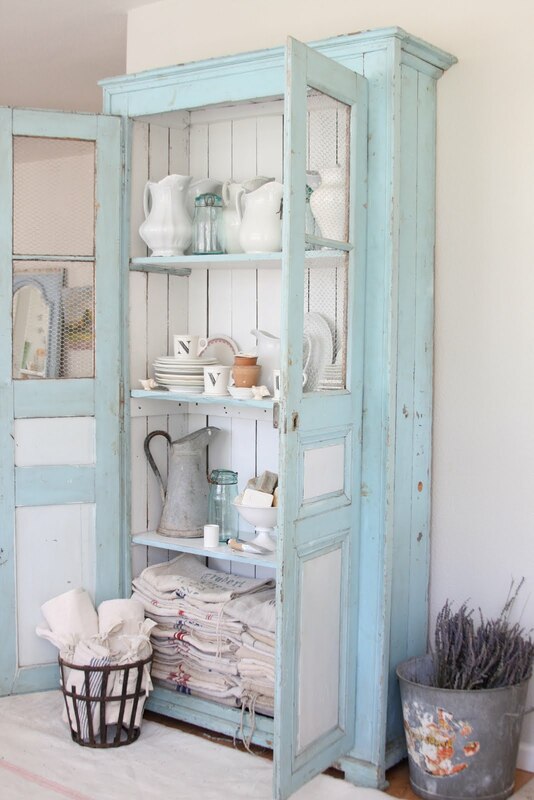 I could not love your beautiful blue cabinet more! I am trying turn my family onto the idea of using more color to lighten up our log home (well over a hundred and fifty years old). I think the lovely images you posted will help make my case. 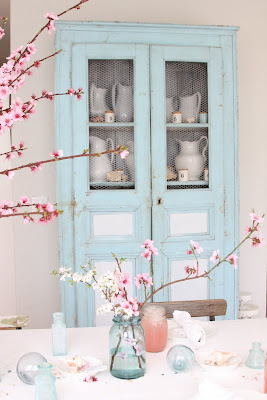 I never tire of visiting your blog, each pick up more ideas for my many projects, decoration, home reforms to place a lot of details I need in my home, my friends, every day, thanks for sharing. Hello! I'm sorry to ask you this as I'm sure you've answered it many times already, but what color did you use on your gorgeous french leaning mirror pictured beside your reupholstered chair? Thank you so much! I know I'm late to the game here, but I just saw your blue cupboard on Pinterest and discovered your blog. I am in love with every single photo on here!!! It's going to be finish of mine day, however before finish I am reading this wonderful post to improve my experience. I am completely new to blogging however I do write in my diary every day.